I just absolutely love Custard Sauce – Creme Anglaise. I don’t see it a lot these days, but you probably know it. It’s the luscious vanilla dessert sauce that taste’s like the best premium ice-cream you can imagine and it’s also the base sauce for Floating Islands and a thinner version is used sometimes for our classic Egg Nog. Really, it’s just a thinner, saucy homemade pudding. Yum! Custard Sauce – Creme Anglaise usually includes eggs, sugar, milk and/or cream so it really does start out like a pudding, custard or ice-cream base, although it is a bit thinner. It seems like these days every recipe can be excessive and “cheffed up” including this one. I came across a recipe recently that had 6 egg yolks ad a vanilla bean, and while it must have been awesome, I like the idea of this absolutely delish and more classic, foolproof sauce I adapted from the Hungry Mum. It’s delicious, silky and lovely, and won’t “steal” the show when served with another dessert. It has just the right amount of body to pour and nap, then pool, enveloping your dessert within its rich embrace. Custard Sauce Creme Anglaise is just the right thing to fancy up all kinds of desserts. It’s great with my Individual Chocolate Lava Cakes (add a touch of espresso powder to the sauce) or Chocolate Souffles or napped over things like Bread Pudding, Apple Dumplings or in this case, My Irish Apple Pie Cake. I want to give a shout out to the Hungry Mum, from Australia. Back in the day when you needed a recipe, mostly you asked around. Like an antique dealer, I knew the provenance of every recipe I made and wrote it in the upper left of the recipe card, just like Mom & Grandma did. It’s so much fun to leaf through their recipe boxes (and mine) and remember old friends, some long gone. So I’m tagging this from Hungry Mum, who introduced me to Chooks, Bickies, Slices, and Donna Hay, and reached out and gave a like and a comment here and there during my early years of blogging. And that was when my blog was so bad, it was a leap o’ faith on her part. St. Patrick’s Day is coming up and I lapsed into the Irish for a moment there. See this custard sauce is destined for an Irish Apple Pie Cake, sometimes called a Kerry Apple Cake, but more on that on my next post! In the meantime, thanks, Mum, for the recipe, which I’ve Americanized and altered just slightly, and for your fun, fun blog. I love seeing what delicacies you’re making up and hearing about your “Misses” and Chooks! 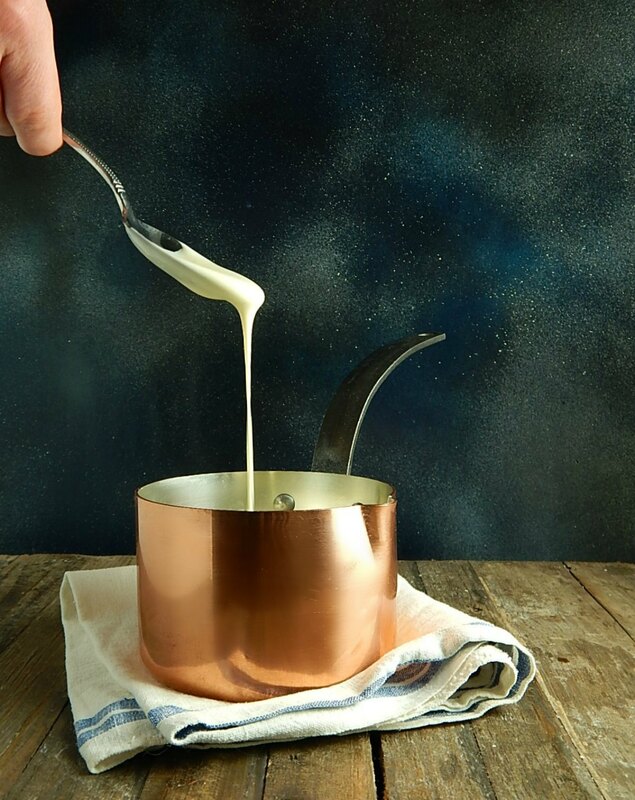 I mentioned this Custard Sauce – Creme Anglaise is foolproof and this one really is. It has just a touch of cornstarch in it which helps temper and add just a bit of body and gives it just a bit of protection from “breaking.” There’s no need to go through some of the usual heroics of making a custard, like using multiple bowls to “temper” which is when you pour the liquid into the eggs, mix, pour that back into the sauce and so on. This is one pan and super easy. You do have to be careful with any custard to bring it up to heat very slowly. That keeps the sauce from “breaking” or becoming grainy. High heat, too fast, can cause the proteins from the eggs to harden and the sauce to separate and turn grainy. There’s no saving that hot mess. This foolproof recipe is far less prone than most, but go slowly and be patient and whisk a lot! Once the sauce is done, you can strain or not, as you wish. All chicken eggs have what is called the Chalaza, the bit that holds the yolk in place and that doesn’t dissolve into the sauce but instead can leave a few small hard bits behind. In the freshest of eggs it might not even be noticeable but in older eggs, it can be more pronounced. The same strategy works for refrigerated items like cream and eggs, both of which have a long shelf life in the fridge and keep well for weeks. They’ll be on sale around almost every holiday. Aldi is a great place to pick up all these items and their everyday prices rival the best grocery store sale prices. Put the egg yolks in a medium saucepan with the cornstarch and sugar. Use a metal whisk to combine all the ingredients well. Whisk until lightened in color. Gradually whisk in the milk and cream then place the pan over a low heat and cook gently and slowly for 6-8 minutes, whisking constantly, until smooth and thick. A light simmer is fine, but do not allow to come to a heavy boil, which can happen towards the end if you stop whisking. Remove from the heat and stir for another minute or two, then add the vanilla. Pouring through a sieve is optional, but will remove any small imperfections or harder bits from the egg. When it has cooled pour into a jug, cover with plastic wrap and leave in fridge until needed. Note: Caster sugar is like our American Super Fine Sugar. It can be bought, generally in small boxes or whirred up in a blender or food processor. For this small amount, I just use about 2 tablespoons plus 1 teaspoon of granulated sugar. This entry was posted in Click here for Fabulous Food Posts and tagged custard, Dessert Sauces, Desserts, English, Hungry Mum, Irish, Pudding. Bookmark the permalink. I’ll be watching for them! And this post, well, one might say it’s all YOUR fault! haha…The problem is, now I have a little left over, so I’m going to have to bake something else up to use it all!